Click the image to see the grid being used. 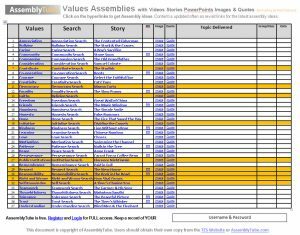 Hundreds of Values Assemblies Ideas all categorised. Includes Assemblies on British Values. Now updated to include POWERPOINTS as well as stories, images and quotes. This document links to an on-line database. Allows you to access the Assemblies and record details of when you delivered the Assembly and to whom. When you click on each of the blue links you go to the Free Assembly Website where you can access the full details of the Assembly idea. The Values Based Assemblies are constantly being updated so there are new Assembly ideas everyday. Appreciation Bullying Caring Community Compassion Consideration Contribute to Lives of Others Co-operation Courage Creativity Democracy Equality Faiths Freedom Friends Happiness Honesty Hope Initiative Kindness Learning Love Motivation Patience Peace Perseverance Public Institutions Remembrance Respect Responsibility Right and Wrong Self Knowledge/Esteem/Confidence Teamwork Thoughtfulness Tolerance Trust Understanding. If you like this, Join the Club & get ALL OUR DOWNLOADS FREE! CLICK HERE! Now updated to include Assembly PowerPoints! Get your copy today.